The Latest News is that Chandigarh Education Department (CED) has released admit cards for written examination which is going to be conducted on 14th February to 28th February 2015 for the 548 posts of TGT Master Mistress in Chandigarh. CED has also released schedule of examination for candidates who are going to appear in the examination. The Medium of written examination will be English only. No interview will be conducted for the final selection of the candidate for these posts. Admit card is mandatory card which is valid with photo identity proof of the candidate. Candidates must produce their admit card before appearing to the examination hall. It is advised to the candidate to reach on time at the venue of the examination. Late coming candidates will not be allowed to appear into the examination hall. No item other than admit card, photo identity proof (original), blue/ black ball point pen will be permitted to carry into examination hall. It is advised to the candidates that to note down their venue of examination and ensure route to reach the destination on time. 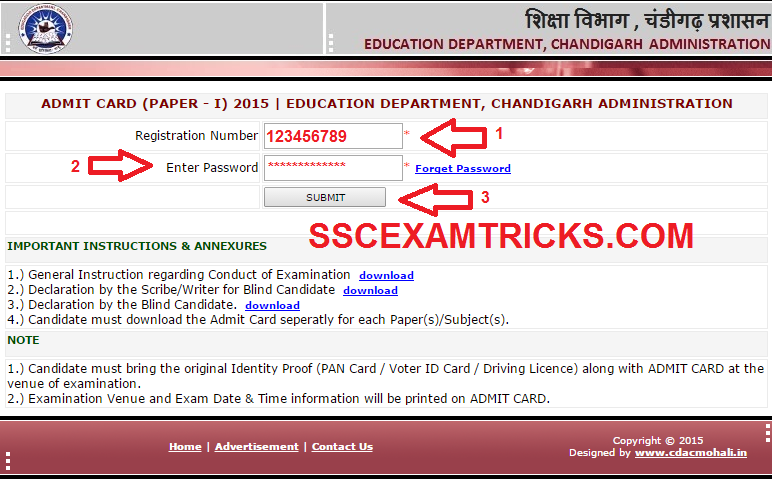 Candidate can download ONLINE Admit Cards for these posts available on official website of CED. Those candidates who have applied for CHANDIGARH TGT Exam 2015 and are waiting for ONLINE admit cards can download their Call Letter/Admit Card from the direct link provided below. Chandigarh Education Department (CED) had invited application from the notification through Advertisement to fill up 548 posts of Masters/Mistresses (TGT) on regular basis as per following details in the pay scale of Rs. 10,300-34,800+Grade Pay 5000 (With initial start of Rs.18,450) of various subjects i.e. Science (Non- Medical), Science (Medical), Social Studies, Mathematics, Music, Fine Arts, English, Hindi, Punjabi, Sanskrit, DPE and Home Science. A huge numbers of candidates had applied for these posts. 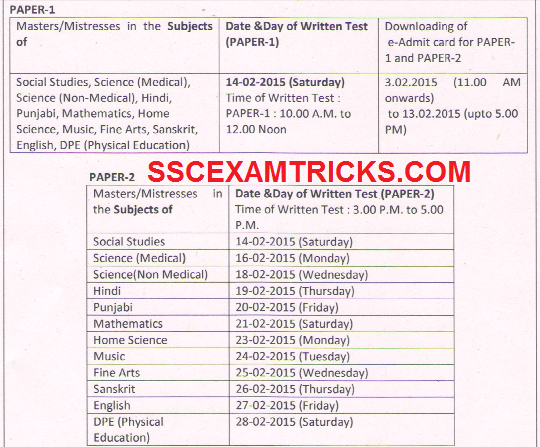 · Click on the check point to download Provisional Admit Card for TGT Exam. · Download RBI Admit Card. 5. Note down room no. floor and seat position of the back side of the Admit Card page. Note that there is no news about postponement of Chandigarh TGT master mistress Exam 2015. There no official notification about postponement of written exam. Don't fall in any kind of confusion, just focus on your preparation and Do your level best in the written examination.